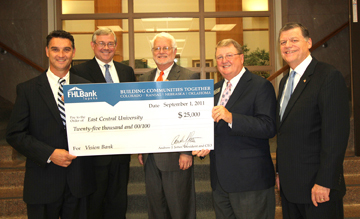 Wendell Godwin (left), dean of the School of Business at East Central University, and Jim Hamby (second from right), CEO of Vision Bank, hold a $25,000 check, part of the bank’s $100,000 gift to ECU for the construction of a new business and conference center. The check represents a grant awarded to Vision Bank from the Federal Home Loan Bank of Topeka. Joining in the presentation are Jeff Hairston (second from left), senior account manager with Federal Home Loan Bank, ECU President John Hargrave and U.S. Rep. Tom Cole. A $100,000 gift to East Central University from an Ada bank will go toward the construction of a new Business and Conference Center and School of Business on the Ada campus. Vision Bank combined a direct gift of $75,000 with a $25,000 economic development grant it received from Federal Home Loan Bank for the gift to ECU. The FHL Bank, a wholesale financial institution, awarded the grant to Vision Bank through its Joint Opportunities for Building Success (JOBS) program. JOBS helps financial institutions throughout Colorado, Kansas, Nebraska and Oklahoma promote jobs and economic growth in their communities. The three-story, 62,000-square-foot facility will provide new technology and innovative approaches to students in the School of Business. As a conference center, it will be one of the largest venues for community events in the area. It will be capable of seating 500 at banquets and can be divided into three breakout rooms.